It’s celebrity week, here at Spinfuel VAPE! 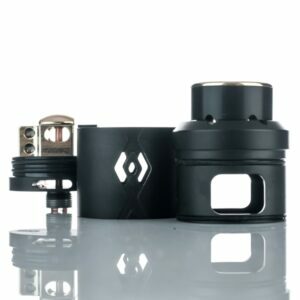 Hot on the heels of reviewing the Hellvape Dead Rabbit RDA, a partnership with YouTube personality Heathen, comes the Sumo RDA by Bruce Pro Innovations. Bruce Pro is a noted Chinese vape product reviewer, and much like so many other personalities, is throwing his hat in the ring with his own personal device preferences. 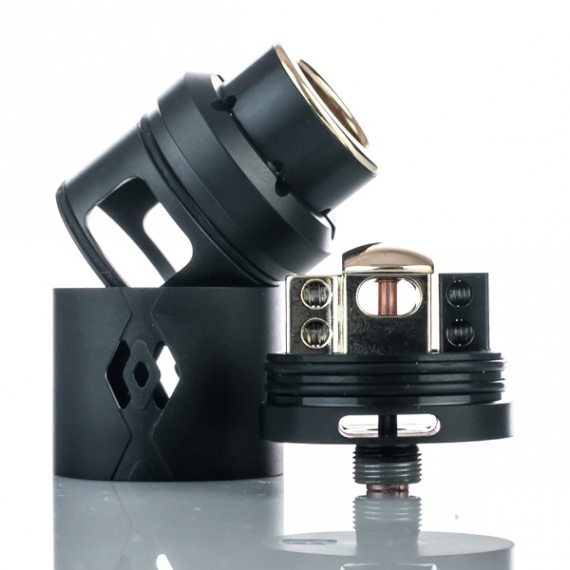 The result is a high-end RDA, which looks amazing, and – with dual airflow intakes – offers the massive clouds today’s volume Vapers demand. But the best part of the Sumo RDA is ironic. Because, for all the cloud coverage you’ll create with the device, it’s modeled after something designed to protect you on cloudy days – an umbrella. People in long-term relationships, don’t pull the Sumo box out of your pocket in restaurants or crowded ballgames, because people WILL think you’re proposing marriage. This cube-shaped, black and gold packaging features nothing but a stark, single-color logo, and could very easily hold a ring (and an awkward conversation to follow). Inside, things are equally minimal. The Sumo RDA sits upright in a form-cut (and romantic pink) foam insert, with nothing accompanying the device but a small bag of spare parts. No instructions, no warranty, no warnings. Just a smoothly finished, matte black dripper (there’s also a gold version available), and a lot of assumption about your skill level. Clearly, Bruce Pro isn’t aimed at beginner RDA users. Nor should it be; even with a wide, seemingly simple build deck, the Sumo takes a little work to understand, and a little more to operate properly. But when it does, back up and let it fly, because Bruce Pro created a performer. As mentioned, my test edition of the Sumo was a clean-looking, nicely finished black matte, with subtle cutaways on either side for adjustable airflow. There are also adjustable airflow slots on the drip-tip, and permanently wide-open 2mm bottom airflow slots to complete the trifecta. Man alive is this thing windy. But more on that in a bit. Taking apart the 25mm-diameter Sumo, we find a mile-wide, stacked dual-post build deck, with a gold-plated positive post that matches the design to a tee. Obviously, this was chosen first for functional performance purposes. But on some level, it speaks to the level of attention and craftsmanship that Bruce Pro put into the Sumo, and I commend it. The posts themselves have garganutan terminals, capable of handling much thicker coils than I installed. But the large, secure flathead screws held all my wire with ease, and no unwanted play after installing. Completing the deck are two key items. First, the deep, 5mm juice well, which is capable of capturing a ton of overflow from the massive coils enthusiasts are likely to place on here. 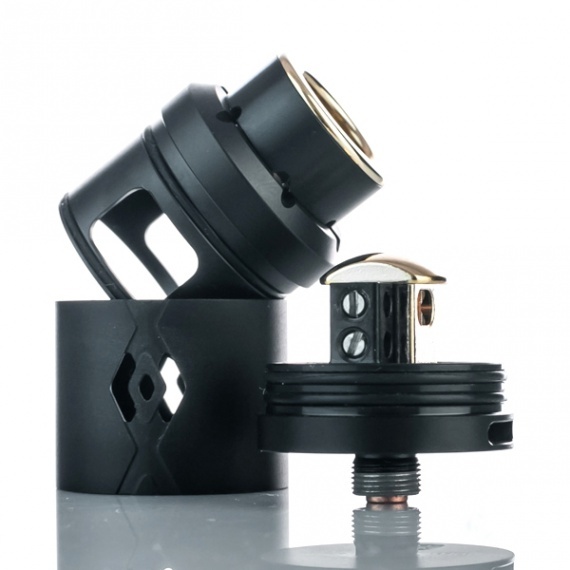 Secondly, my favorite feature of the Sumo RDA – and perhaps the simplest – a “drip suspension shield” designed like an umbrella for your e-liquid. This simple top-facing addition at the center of the build deck serves as a funnel of sorts, redirecting your juice to either side of the deck, directly onto your coils. The juice well catches runoff with ease, making it simple to drip through the 7mm wide bore drip tip. Though it’s hardly a novel idea, this umbrella works beautifully here, and really improved my experience with the Sumo RDA. Bruce Pro didn’t create the Sumo for newcomers. That’s not to say it’s overly complicated, or unwieldy. It’s just clearly aimed at Vapers who want to push the limits of their builds, and their cloud production. To put the Sumo through its paces, I grabbed a few 3mm fused claptons from a collection I use for every test. 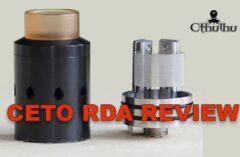 And for the first time since joining this staff, and testing all-new products, they weren’t a great match for this RDA. Now, to be clear, the fused claptons were more than adequate. But “adequate” isn’t the goal of the Sumo RDA. This competition-grade dripper was designed to create massive clouds with flavor to match, and my go-to coils were largely inadequate for this monster device. I moved to a flat ribbon coil made by a friend, and started to smile a little more. The wider coils, with increased surface area, heated more evenly than my homemade claptons, and the difference was immediately noticeable. With a 0.2-ohm build, at around 90 watts, the Sumo began producing clouds with their own weather systems, and flavor unlike anything I had experienced in some time. The multiple airflow channels make it easy to fine-tune the Sumo RDA to your liking. I found my best flavor performance to come from closing off the adjustable side airflow entirely, letting the bottom slot do the heavy lifting. There was more than enough flow throughout the Sumo, even if it did get a little hot at this setting. The joy was fleeting – even with the deep juice well, this particular build was thirsty and I needed to be attentive to the cotton at all times. Thank goodness for the easy top refilling and – yes – the little umbrella juice distribution add-on. Please note that with more conservative coils and use, the juice well allowed for longer durations between refills. Clouds of this magnitude don’t come cheap, and the tradeoff here is that the Sumo RDA isn’t really appropriate for chain vaping of any kind. Maybe it was my builds. Maybe I was running the wattage too high. But the Sumo gets REALLY hot, especially on and around the drip tip. The matte-finished body also gets warm, but nothing uncomfortable. 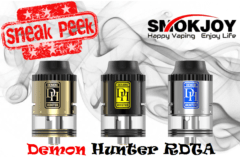 The drip tip, on the other hand, has a gold-plated rim that heats rapidly when firing, making extended drags near impossible. Even with airflow open throughout the device, the Sumo becomes thermonuclear above 70 watts. Swapping out for a different tip calmed the firestorm a bit, but the Sumo is still awfully warm, even at moderate wattages. Now, I know this was designed for cloud performance, so extended use and long drags might not have been front of mind when Bruce Pro sent the Sumo to production. 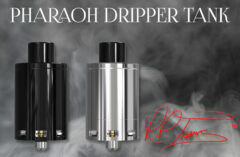 But I’ve always found the best drippers to be the ones that can perform for average, everyday use, as well. I think the Sumo might be a little TOO advanced for newcomers to enjoy, especially with the excessive heat that radiates from the mouthpiece. But build junkies and competition-level cloud producers? 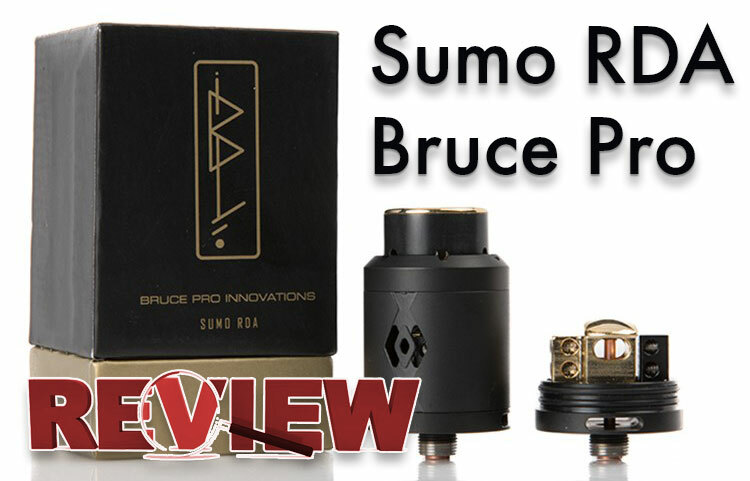 Bruce Pro has created an RDA worthy of – well – pros. The Sumo RDA isn’t the easiest device to build on, but once you find that sweet spot, you’ll be rewarded with vape performance worthy of YouTube videos.